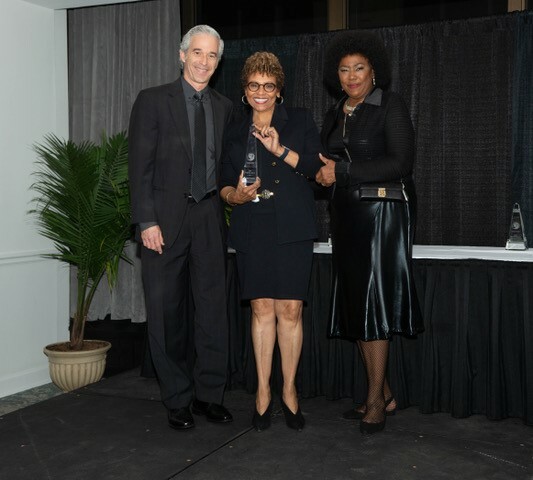 In honor of its Supplier Diversity Program, an initiative created in 2015 under Director of Community Relations Joyce Searcy and Vice President and General Counsel Jason Rogers’s leadership, Belmont was recently awarded the 2018 Corporate Award from the Nashville Minority Business Center during the organization’s 36th annual Minority Enterprise Development Week. The multi-phase program, aligned with the University’s commitment to becoming more diverse and broadly reflective of its local and global community, was created as a mutually beneficial opportunity for Belmont and minority businesses. In Phase 1, the University worked to build relationships with vendors and minority business leadership, communicating Belmont’s goals to increase supplier diversity. Phase II created opportunities for vendors to market their products to two key departments on campus – Auxiliary Services and Facilities Management. Searcy, along with Vice President and General Counsel Jason Rogers, accepted the award on Friday, November 30 at the Minority Business Honors and Recognition Awards, held at the Nashville City Center.